First of all, apologies for the delay in getting this latest update out there! A lot of my focus lately has been around documentation, bug fixes, and other behind the scenes improvements, but there are a few small features here and there that have been added since my last development update. Since I’d like to start building out the combat systems more in the near future, I thought it would make sense to go ahead and implement some of the functionality around damage and healing. One feature related to damage that I added is the handling of the player being defeated. In combat, if the player’s health reaches zero, their “death” animation will play (if defined for that character model) and a “Game Over” screen will display informing the player to press SPACE to restart the game. To complement this, the Item Editor now has an option that lets you define an item as “usable”. If an item has been defined as such, you can also specify the number of uses permitted as well as a script to trigger whenever the player uses the item by right-clicking it. There are also two new scripting functions, “Damage Entity” and “Heal Entity”. Currently these only work for the player character, but they can be used to either damage the player or heal the player via scripting. 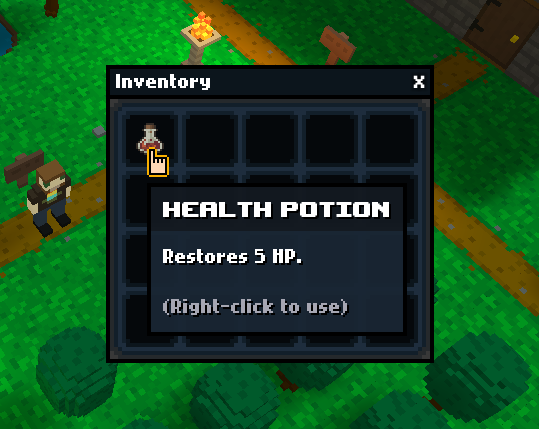 This will allow you to create items such as healing potions that will heal the player, or tiles that damage the player as they walk over them. Damage/healing numbers will display to indicate the values as they are added/subtracted from the player’s health. I’ve also continued working my way through converting the Tiny Dungeon sprites into voxel models. There are a lot of sprites, but I’ve devoted around 10-15 minutes each day to completing the task! At this point, I only have a handful of the item sprites remaining. I’ve also been experimenting a bit with a roguelike mode using the Tiny Dungeon models that I think may work out pretty well! There’s still a lot of work before it becomes a viable game mode, but I’ll be chipping away at it in between other development. As you can see below, the cast of Tiny Dungeon characters is growing! Every once in a while, I like to play around with ideas that pop into my head as a break from development, and this time I thought it would be cool to create a Crossy Road style prototype within RPG in a Box. What’s shown below is mostly scripted (the cars are triggered to move across as the player steps onto certain tiles), however this was all done using functionality currently available in RPG in a Box. With a few more features (for example, randomizing and looping), it could probably get pretty close to the gameplay of Crossy Road! Crossy Road was one of the influences that led me to the voxel style of RPG in a Box, so it was really cool seeing how easy it was to throw something like this together. 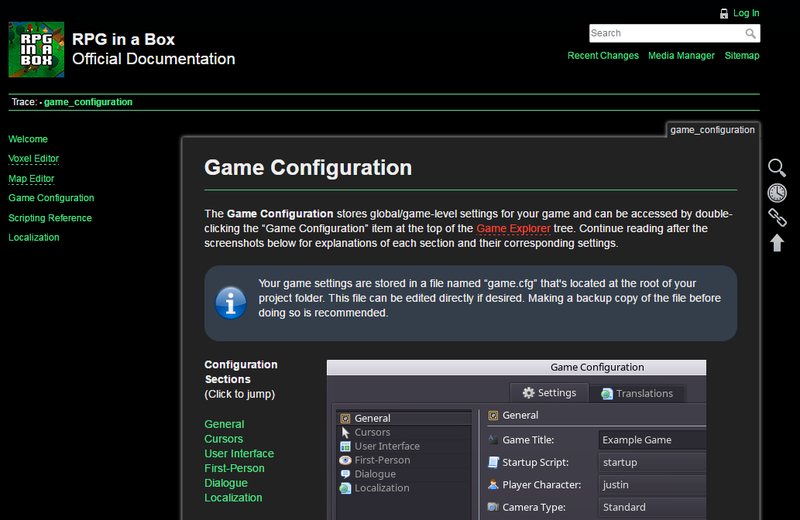 As I mentioned in my previous post, I’ve also been working on the new documentation site for RPG in a Box. I finally made it through all of the scripting reference pages and have moved onto the various other pages. I am striving to make the documentation as comprehensive as possible and including explanations for any concepts and features that I think would be helpful to the community. One final note regarding the Steam Early Access release date: I originally indicated the window as being Q3 of 2017, but at this point it’s looking like I may end up pushing the estimate back to Q4 of 2017 due to certain dependencies and general time constraints. I’d like some of the major features such as combat to be more complete and polished before releasing it on Steam, and I will also be taking this time to upgrade RPG in a Box to Godot 3.0. As a reminder, Founder’s Access is available on Itch.io and includes a Steam key that will be distributed once it goes live on Steam. Once the remaining Founder’s Access keys are gone I will still continue selling it on Itch.io as early access.